The material to be dried / cooled comes in direct contact with the drying / cooling media. The dryer comprises of a rotating shell supported on rollers / tyres and driven by means of suitable drive arrangement. Drying / Cooling media (Air / Gas) is admitted through stationary hood at one end & taken out from stationary hood from other end. Feed is admitted through suitable feeding mechanism like Screw feeder / Chute. The rotating shell is provided with specially designed material showering mechanism like Lifters / Garland Chains etc. Shell inclination & rotating speed facilitate forward movement of the material towards discharge end providing required residence time. Drying (or Cooling) takes place by heat transfer to (or from) showering material with the drying (or Cooling) media within the shell. Product is discharged from the stationary hood through suitable equipment like Flap Valve / Rotary Valve / Screw Conveyor / Chute. Cyclone Separators: Mono, Twin, Quadruple, Multi etc. Bag Filters: Reverse Pulsejet, Mechanical shaking etc. Back mixing of product with feed material. Pneumatic conveying system and finish product handling. The material to be dried does not come in direct contact with the drying media. 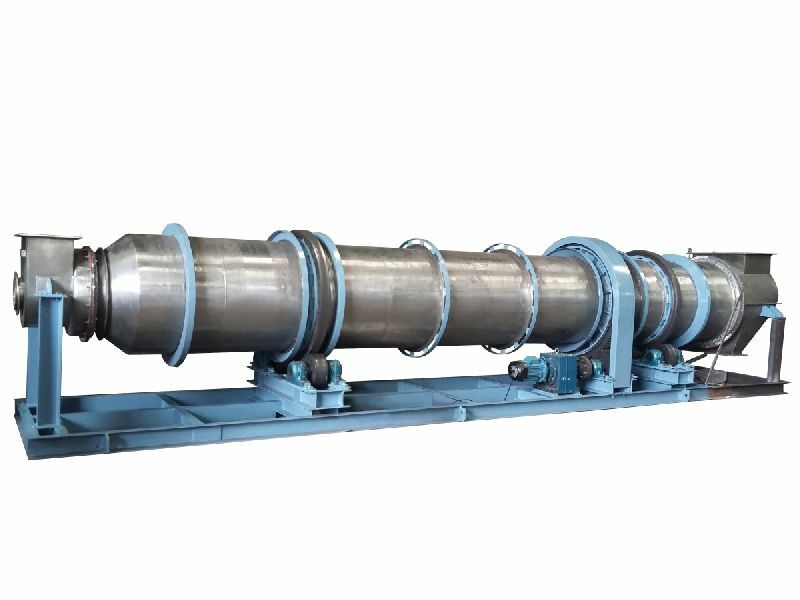 The dryer comprises of an assembly of two concentric rotating shells supported on rollers / tyres and driven by means of suitable drive arrangement. Feed is admitted through suitable feeding mechanism like Screw feeder / Flap Valve into the dryer through stationary feed hood. The drying media is admitted through the inner shell & travel towards discharge end & again returns towards feed end through specially designed return gas passages on the inside of outer shell. The inner shell is also provided with suitable radial lifters. These lifters along with return passages geometry is designed for showering of feed material. Shell inclination & rotating speed facilitate forward movement of the material towards discharge end providing required residence time. Drying takes place by heat transfer to the showering material by direct contact with inner shell & return passages. Product is discharged from the stationary hood through suitable equipment. Direct Fired Air Heaters : Using Liquid / Gaseous Fuels. Direct Fired Air Heaters : Using Solid Fuels, Agro Waste, Saw Dust, Rice Husk, Coal, Briquette etc. Back-mixing of product with feed material.